Okay. A few weeks ago (I’m lying… it was a few months ago. shhh) a reader asked me to do a post on dorm solution ideas. “Great idea!”, I thought. Then summer happened. So, finally, here it is! AND I feel like the timing is a little perfect because: a. It’s better to get a head start on things like this, and b. The stores are in “summer mode” right now, so it’s a good time to be buying storage supplies for less! One more thing: I do have to divulge that I’ve never actually lived in a dorm (aside from a week-long softball camp at Auburn), BUT I did live in a studio apartment in college, which is pretty similar! Okay, here we go! 1: Make sure that you have the right layout. If you follow me on Pinterest, you may have noticed that I pin a lot of Feng Shui things. Now, before you skip right over this because you don’t believe in “energy flow”, hear me out! So many Feng Shui rules are backed up by psychology, and there is a ton of information out there that discusses how important environmental factors are to learning (which is why most high schools have that medium blue color in the hallways). This Greatist Post by Jordan Shakeshaft explains how to arrange a dorm room perfectly! If it doesn’t have a home, find it a home; if you can’t find it a home, get rid of it. 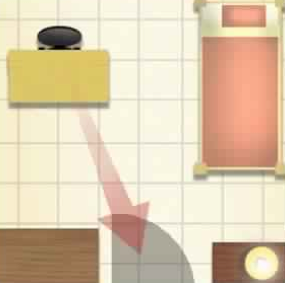 Tiny spaces are the ones that are the MOST important to keep clutter-free! You know that feeling you get when you walk into an old person’s home and it’s just full of every little figurine or paper they’ve ever received? That’s the feeling that others will get when they walk into your dorm that’s overflowing with textbooks, picture frames, makeup, and clothes that can’t fit into the closet. 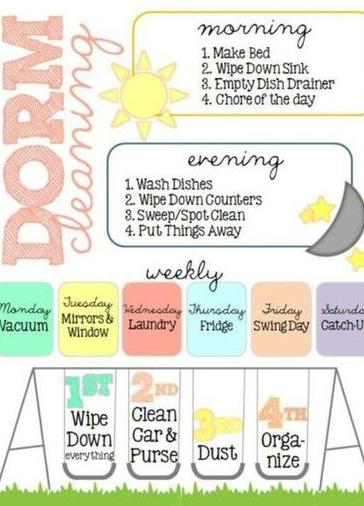 I like to try to get rid of 15 things every week! I promise, it’s easier than it sounds! The most important part of a "storage solution" is, of course, the storage! In our new loft, I don’t have an office like I did in my house, so I’ve had to hide my office supplies in plain sight (more on that coming soon!). First, make a list of everything you’ll need to store: textbooks, computer, chargers, notebooks, files, etc. 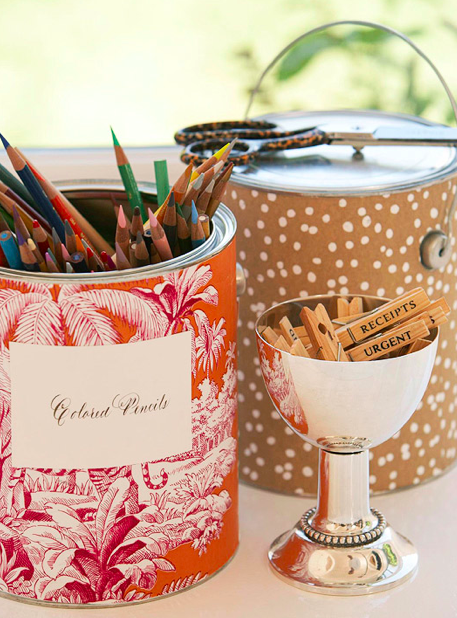 Then, look for (or create) pretty storage solutions for each thing! I don’t mind displaying things that are uniformed, such as clothespins, paperclips, binder clips, matching pens, etc. However, find a “hidden" home for things that are mismatched, sloppy-looking, or just plain unsightly (used textbooks, for example. EW!). The Container Store, Etsy, Office Max, and Target are just filled with canvas bins, covered storage containers, and cute document boxes. OR, you could take to Pinterest and find ways to create your own pretty storage solutions out of paint cans, plastic cups, shoeboxes, etc! Functionality is essential in small spaces! The more purposes that a piece serves, the more valuable it is! 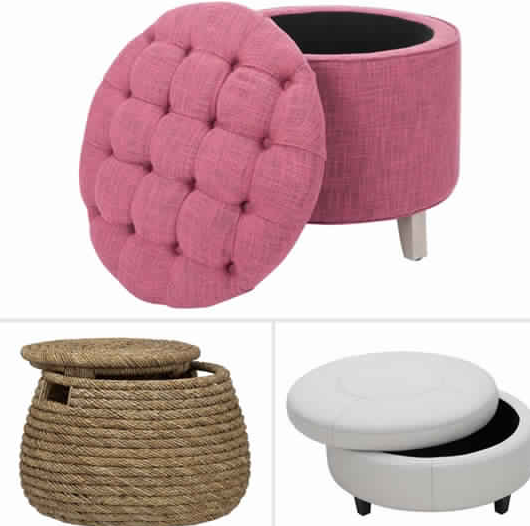 Target’s furniture aisle is always filled with $40-ish ottomans that can be used as a table, extra seating for friends, and a place to discreetly store books, extra blankets, or even shoes! Always be on the lookout for things that can pull double duty such as bedside tables with lots of drawers, decorative vases that could store writing utensils, or jewelry organizer/mirror combos! When I was in undergrad, I made the mistake of having a “cleaning day” once a week… which would have been a great idea, if every week looked the same! However, things always came up for me to do on my cleaning day. Then I would get all stressed out over how messy everything was! Now that I’m older (and oh-so-much-wiser), I just do a little bit every day! There are literally hundreds of cleaning systems out there! I use this one from Apartment Therapy! But FlyLady and Modern Parents Messy Kids have some nice ones as well! 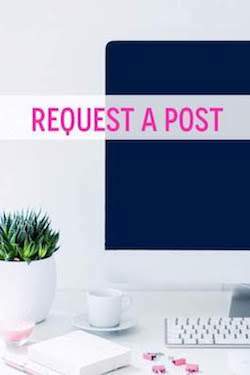 And, of course, I have a Pinterest board just full of printable to-do lists to help you stay on track! When it comes to storage solutions for small spaces, the options are limitless! 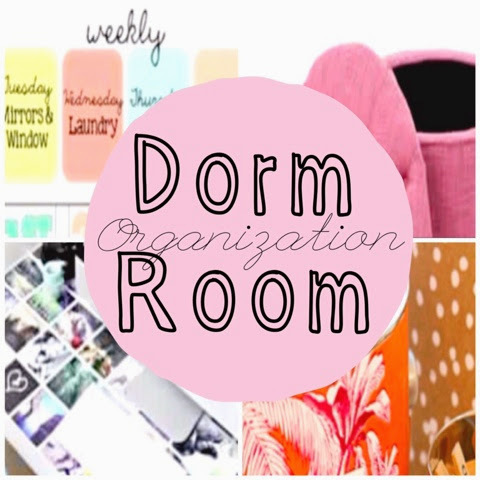 Feel free to add any advice, information, or links to your favorite dorm organization solutions below! Do you want to know about storing anything specifically? !